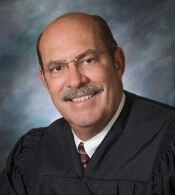 Judge John Ellsworth was elected as the Casa Grande Justice of the Peace in 2014. He started his career in the criminal justice system in 1973 when he enlisted in the United States Air Force as a military police officer. Judge Ellsworth joined the Casa Grande Police Department in 1978 and retired as a sergeant in 1998. John served for the next three years as a criminal investigator for the Arizona Department of Corrections, before joining the Pinal County Sheriff’s Office in 2001. He retired from the Sheriff’s Office in 2014 as a lieutenant assigned as the Operations Commander of the Criminal Investigations Bureau. Judge Ellsworth is married, with three adult children and four grandchildren residing in the Casa Grande area.